When you think of autumn, you most likely envision the beautiful orange, yellow, and red hues of the season. Stroll down the produce aisle of your neighborhood grocery store and discover those same vibrant colors in the form of seasonal vegetables and fruits, such as pumpkins, squash, and apples. Best of all, these harvest foods also are packed with nutritional value. Winter squash and pumpkins (both members of the gourd family) come in a wide variety of colors and sizes. they are versatile for use in both sweet and savory recipes, and they are good sources of complex carbohydrates, vitamins, and minerals. Pumpkins are especially good sources of alpha- and beta-carotene, beta-cryptoxanthin (an antioxidant), vitamin C, riboflavin, and iron. Cooking pumpkins (also known as sugar pumpkins or pie pumpkins) are delicious in pies, cookies, custards, and soups. Their seeds are easily toasted for a crunchy high-fiber snack. The seeds are great eaten by the handful or added to fruit and vegetable salads. Pumpkin and squash seeds contain folate, carotenoids, phosphorus, selenium, and zinc. Apples come in countless varieties, each with its own color, flavor, and texture. 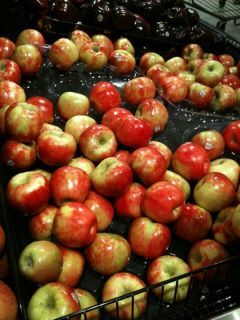 While some types of apples such as Honey Crisp or Gala are best for eating fresh and crisp, other varieties such as Crab, Bramley, and Jonathan apples are best for cooking in pies, cakes, crisps, and chutneys. Look for sauce, butter, pickle, and relish recipes that include apples. Apples are powerhouses of flavonoids, such as quercetin, as well as a great source of cholesterol-lowering phytosterols. Apples also are a good source of vitamin C. In addition, apples with their skins are one of the best known sources of pectin—a type of soluble fiber shown to help reduce cholesterol. Try cinnamon baked apples or you can core an apple and add cinnamon, pinch of brown sugar, and 1 TBS of granola and bake in the oven for a warm fall treat! ▪ Thoroughly wash all vegetables and fruit, as you would any produce, before eating or cooking to destroy any bacteria and to remove any pesticides or herbicides from their surfaces. ▪ Select produce without soft spots, blemishes, or cuts. ▪ Eat fruits and vegetables fresh or lightly cooked to obtain the most nutrient value. Avoid boiling when possible. ▪ Experiment with a variety of spices, herbs, and cooking methods. 1. 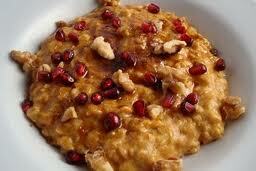 In small saucepan, combine the soy milk, sugar, pumpkin, vanilla, and spice. Bring to a gentle boil and stir in the oatmeal. Reduce the heat to simmer for 2-3 minutes, until the oatmeal is soft and creamy. 2. Spoon the oatmeal into bowls and sprinkle with dried fruit and nuts. *Delicious and Nutritious Breakfast to warm you up for Fall. 4th of July Picnic Staples That Won't Ruin Your Waistline! 4th of July Weekend is finally here! There will be plenty of outdoor barbecues, food, fireworks, and fun going on! If healthy meals and snacks are not planned out beforehand, it can become an endless series of mindless eating that may take many hours at the gym to burn off. 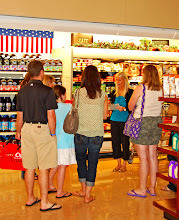 • Grocery Shopping: Take a minute to really think about what is most important to you before you go to the grocery store. Decide on your weekend meal plan and write your grocery list accordingly before you shop. This helps you save money and time at the grocery store and you will feel good about the choices you make and prepare accordingly. • Water: Pack plenty of water. Don't waste your money on soft drinks, juices, or non-nutritive beverages. Use juice boxes containing 100% juice as an occasional treat for kids, but even the most healthful juices contribute excess calories. Teach kids to drink water now, and they will do this forever. Freeze your water bottles or partially freeze them. Take individual Propel packets with you to add to water bottles to add some flavor and provide electrolytes when outside in the heat all day. • Fruit: Natures candy is fruit. Pack fruit whole if you can, so you have less to clean up later, or slice it up and put it in plastic containers. You can also freeze grapes and blueberries for a yummy snack. It is virtually impossible to compromise your health by eating too much fruit or too many vegetables; so, pack extra. You will eat them! • The menu: Consider foods that don't spoil as quickly as "main" dishes. Bagels, Sandwich thins, High fiber crackers, Individual packets of humus and peanut butter, dry turkey sandwiches (Add the condiments later), and vinegar-based pasta and black bean salads. • High-fiber snacks: Portion your own high-fiber snacks into snack baggies. This way you can control your snack foods. Look for 3g of fiber or more per serving for snack food items. As soon as you open crackers, nuts, pretzels, cereals, dried fruit, popcorn, and trail mixes, separate them into serving portions and store the item in individual baggies. This way you are less likely to overeat from the larger container. Have a Happy and Healthy 4th of July! Nothing says summer like the smell of grilling out in the backyard! Summer cookouts provide a great opportunity to visit and impress friends and family with your skills at the grill. For your health's sake, be choosy about what you put on the grill. Steaks, hamburgers, and hotdogs can be loaded with calories, saturated fat, and cholesterol! This summer, add variety and healthy options to any cookout by grilling fruits and vegetables. • Cooking vegetables right on the grill adds flavor to any meal. Baste firm vegetables like peppers, corn, eggplant or onions. Season them with herbs and place on a hot grill until they are tender and brown—usually about 10 to 15 minutes. • Place sliced zucchini, tomatoes and carrots on heavy-duty foil and sprinkle with a olive or canola oil and seasoning. Wrap the foil and grill 6 to 8 minutes or until vegetables are tender. Minced garlic works great and also pick up an oil mister from Williams Sonoma to control calories. • Make kabobs out of pineapples, peaches and bananas and grill on low heat until the fruit is hot and slightly golden. • Grill asparagus, green beans, or broccoli and add, sprits of olive oil, minced garlic, lemon juice, and freshly cracked pepper for a delicious side dish. • Use black beans and add to avocado, corn, red pepper, green pepper, Poblano peppers, lime juice, cumin, minced garlic, fresh ground black pepper, Tabasco sauce, tomatoes and use as an excellent dip for a party or serve over grilled chicken or fish (always a crowd favorite). • Make a quick and easy Summer side salad with Spinach, grilled chicken or salmon, sliced onions, strawberries, blueberries, apples, walnuts, and reduced fat gorgonzola cheese with balsamic vinaigrette. Another great reason to add fruits and vegetables to your outdoor cooking repertoire: With the abundance of produce available this time of year, it’s easy to eat your recommended 2 cups of fruits and 2 ½ cups of vegetables a day for optimal health. Remember: In order to make half of your plate fruits and vegetables, your grocery cart must be filled with half fruits and vegetables from the produce section. • "Prime" cuts usually have more fat than "choice" or "select." Choose lean cuts of meat such as sirloin, ground round, etc. • Look for ground beef with the lowest percentage of fat on the label. Try to choose 4% fat or lower. • Grill lean turkey dogs, chicken sausages, buffalo burgers or veggie burgers in place of full-fat options, but make sure to compare the fat on the back of the nutrition facts label as marketing will fool you on many of the hot dog nutrient comparisons. • Buy skinless, boneless, chicken breast without any added flavorings and use your own marinade to add flavor and decrease sodium. • Use whole wheat buns or sandwich thins to increase your daily fiber intake from whole grains. For side dishes, there are great tasting alternatives to heavy, mayonnaise salads and spreads. If a recipe calls for full-fat mayonnaise or sour cream, substitute a low-fat variation or you can use nonfat- plain Greek yogurt. I am personally a fan of Chobani or Fage. Greek yogurt can be used as a perfect substitute for mayo, sour cream, cream cheese, etc.. The tart flavor of non-fat plain Greek yogurt has double the protein of regular yogurt and less sugar. Your potato salads, chicken salads and baked potatoes won't know the difference. Top 10 Superfoods to Eat Now! 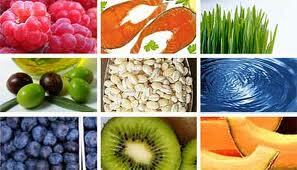 Top 10 Superfoods to Eat Right Now for Your Health! March is National Nutrition Month, the perfect time to take a fresh look at the big picture. The theme for National Nutrition Month is Eat Right with Color and the American Dietetic Association reminds the public to focus on including a variety of fruits, vegetables, whole grains, lean proteins and low-fat dairy on their plate every day. An overall pattern of eating should be the important focus. Not one food or type of food guarantees good health, just as no single food is detrimental to health. Let’s take a look at 10 super foods and different ways you can incorporate them into your diet! Kale is a great source of vitamin A, vitamin C, potassium, calcium, iron, and folate. In some studies, kale has been shown to lower the risk of developing certain types of cancers. Try serving kale with other foods high in vitamin C such as strawberries to help increase the absorption of iron. Greek yogurt has twice the protein as regular yogurt! Try substituting Greek yogurt in your favorite recipes for sour cream, mayonnaise, or regular yogurt as a more nutritious alternative. Packed with antioxidants and high in potassium and vitamin C, not only can blueberries lower your risk of heart disease and cancer but they can also help with inflammation. 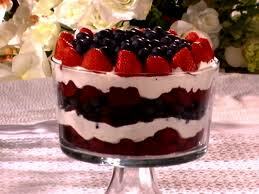 Try topping berries with a little frozen yogurt instead of topping your frozen yogurt with a little fruit. Sweet potatoes are packed with vitamin A and carotenoids and can be baked just like regular potatoes. Try substituting sweet potatoes for regular potatoes in your favorite recipes. Select sweet potatoes that show no signs of discoloration and have a large, uniform shape. Green tea contains EGCG, a powerful antioxidant shown to inhibit the growth of cancer cells. Studies also show that tea drinkers have lower cholesterol. Add some honey or lemon to your tea for extra sweetness. Packed with antioxidants and can lower blood pressure. Remember, the darker the chocolate, the better so buy chocolate that has a 60% or higher cocoa content. Lowers total cholesterol but raises ‘good’ cholesterol. Lowers blood pressure, and reduces the risk of blood clots. Try using garlic to enhance the flavor of your favorite recipes! Also known as soybeans, edamame is an excellent source of fiber, high in protein, and a good source of vitamin C and iron. Edamame is found in the frozen foods section and can be served hot or cold, depending on personal preference. With more vitamin C per serving than an orange, strawberries are the second richest fruit source of antioxidants and have been shown to inhibit the growth of cancer cells. Try buying frozen strawberries and using them in smoothies and salads to add natural sweetener. Pumpkins are a rich source of beta carotene which may help prevent certain types of cancer. Pumpkins are very versatile and can be cooked in a variety of ways. Try drizzling pumpkin cubes with olive oil and roasting them in the oven at 400 degrees for 30 minutes. Combine all ingredients in large bowl and mix together to have a beautiful array of colors and flavors! Also makes a wonderful topping for grilled chicken, turkey wraps, taco salads, fish tacos, eggs, etc. Warning! This healthy dip is delicious and will be devoured quickly! Focus on Nutrient Rich Fruits and Veggie! Drop the DIET eat for LIFE! Ok, so we all know we need to eat more fruits and veggies, but HOW can we possiblly fit 7-9 servings of fruits and vegetables into our daily meal plan. Well, I have listed some quick and easy tips and tricks to squeeze those antioxidant packed foods into your life for good! Fill up on fruits and vegetables first! One of the main reasons that people eat fewer fruits and vegetables during the winter months, and particularly during the holidays, is because they fill up on other types of food first. Try to prioritize fruits and vegetables, and eat other types of food once you have reached your quota for fruits and vegetables. Here are 20 Tips to Sneak Vegetables into Your EVERY MEAL! 1. Eating vegetables, whether canned or frozen is better than not eating any vegetables at all. 2. Grow a vegetable garden. There is nothing like the flavor of a homegrown vegetable. If space is limited, try planting in a pot of soil. 3. Change the texture of vegetables from cooked and soft to raw and crunchy. For example, instead of serving cooked carrots with a meal, try crisp raw carrots instead. 4. Adorn a favorite food with vegetables. Try topping your pizza with chopped bell peppers. 5. Do not be afraid to add a little butter or margarine if that makes the difference between eating vegetables or not. Also, try different recipes and cooking methods for preparing vegetables. MIX IT UP! 7. Steam in a flavorful broth: such as low-sodium chicken or vegetable broth. 8. Throw some vegetables on the grill, either whole or large skewer pieces. 9. 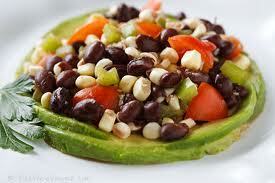 Always double your normal portion for vegetables and decrease your starches such as bread, pasta, and sugar. 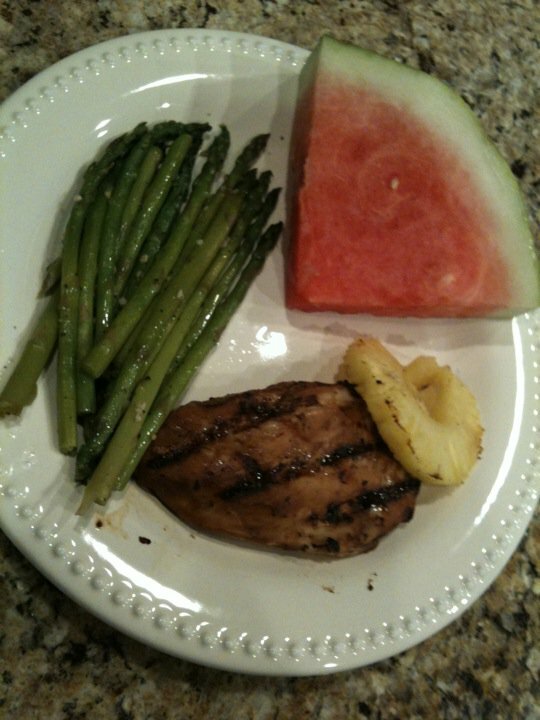 1/2 of your plate should be fruits and veggies, 1/4 lean protein, and the remaing 1/4 starches. 10. Try low sodium v-8 juice for a beverage-it counts as a vegetable serving. 11. Try one new vegetable or vegetable based recipe each week. 12. Take advantage of packaged fresh salad greens like romaine, spinach, and spring mix blend for an instant easy salad. 13. Serve a festive vegetable-snacking platter at home or for parties. Include bell pepper rings and broccoli in addition to the usual veggies. You can make a quick dip like hummus or yogurt based ranch dip. 14. Add chopped tomatoes and other vegetables to burritos, tacos, and wraps. 15. When eating out, plan your meal around vegetables. 16. If eating fast food, try adding a side salad with your meal and always double your veggies. 17. Chop a variety of different vegetables and toss them in your salad. 18. Add leftover vegetables or frozen veggies to your favorite soup. 19. Stock your freezer with frozen vegetables so that even if you have been on vacation or haven't gone grocery shopping-you have no excuse not to eat them. See, you can do it, just have to put a little effort and pre-planning and now you can create a nutrient rich, high fiber powerhouse of fruits and vegetables. If you follow these tips- you won't have much room for other junk!